The biggest misconception is: “I have to give a large contribution.” – FALSE. Every dollar counts!!! 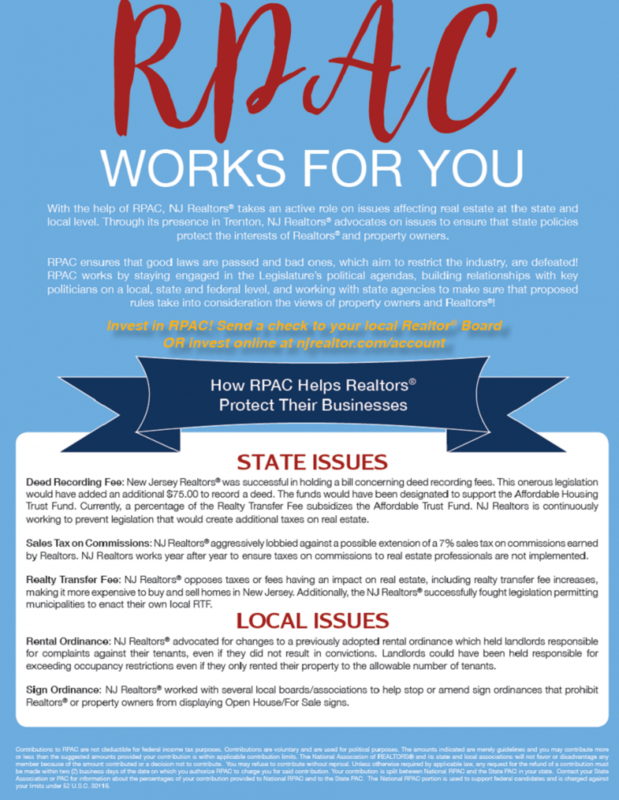 RPAC handles issues on state and federal level as they pertain to Realtors. Although they don’t handle individual local issues, they like to be made aware of them. There is an IMPACT fund set up for local issues that aids in raising issues to homeowners. Regarding state issues- there is a legislative committee made up of members and they recommend the issues that RPAC will support. Political Action Contributions have to be made part of the culture and kept in front of members at all times. 70% of each contribution stays on the state and local levels to help elect candidates who support realtor issues. Any solicitation must include a disclaimer notice as to where the money goes and contributions can only be made by members. The disclaimer has to be written, not done orally. Contributions are not deductible for income tax purposes. Contributions to RPAC are voluntary and are used for political purposes. You may contribute more or less than the suggested amount. You may refuse to contribute without reprisal and the National Association of REALTORS® or any of its state associations or local boards will not favor or disfavor any member because of the amount contributed. 70% of each contribution is used by RPAC of New Jersey to support state and local political candidates. Until RPAC of New Jersey reaches its RPAC goal, 30% is sent to National RPAC to support federal candidates and is charged against your limits under 2 U.S.C. 441a; after RPAC of New Jersey reaches its RPAC goal it may elect to retain your entire contribution for use in supporting state and local candidates.